Egypt is an Afro-Asiatic transcontinental country spanning the northeast corner of Africa and southwest corner of Asia via a land bridge formed by the Sinai Peninsula. Egypt is an Afro-Asiatic transcontinental country spanning the northeast corner of Africa and southwest corner of Asia via a land bridge formed by the Sinai Peninsula. It is officially known as the Arab Republic of Egypt, but it is also known as the land of the Pharaohs. One of the country’s most famous landmarks is the Pyramids of Giza. 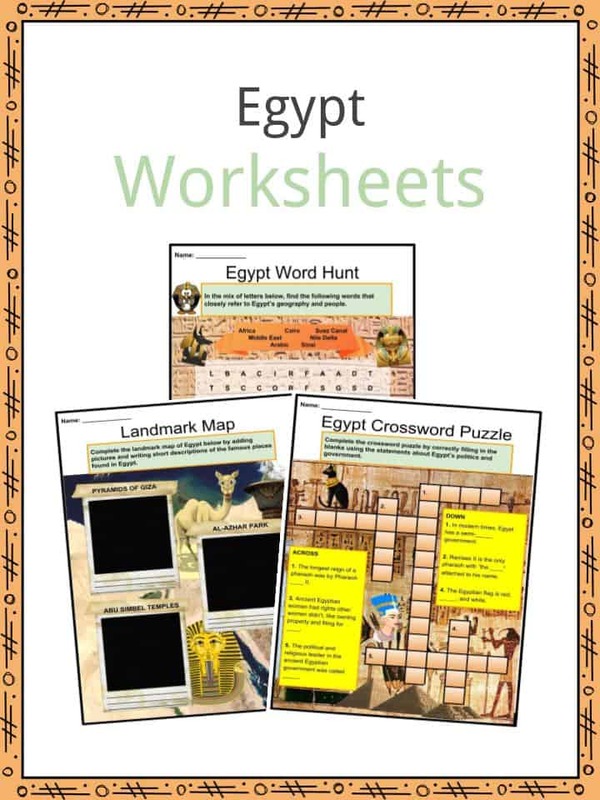 See the fact file below for more information on the Egypt or alternatively, you can download our 23-page Egypt worksheet pack to utilise within the classroom or home environment. Egypt is one of the most ancient civilizations in the world, dating back over 7,000 years. Arabic is the official language. Other languages spoken are English and French. 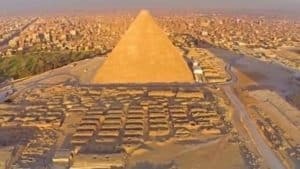 Greek historian Herodotus dubbed Egypt as the “Gift of the Nile” since the flooding of the Nile River every year keeps the desert fertile and nourished. The 365 day calendar we have now was created by the Egyptians to keep track of the annual Nile River floodings. Many gods and deities were worshipped by the ancient Egyptians. There are more than 2,000 deities. Each of those have different roles for which they are worshipped. Pyramids were first built as tombs for pharaohs and their relatives. The shapes of pyramids take after the sun rays. During the Predynastic period of Egypt, neolithic Egyptians favored agriculture over hunting. There existed two kingdoms: the Red Land (north) and the White Land (south). 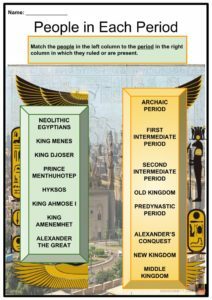 In 3150 B.C., King Menes unified both kingdoms and made himself the first king of the first dynasty, marking the beginning of the Archaic period. Agriculture was still the largest sector of the economy during this period. The succeeding period was the Age of the Pyramid Builders. Upon King Djoser’s request, the first pyramid was designed by Imhotep. The third until the sixth dynasty enjoyed this period for its government’s stability and the country’s overall prosperity. The period ended in ruins when pyramid-building cost a fortune at the expense of the fifth and sixth dynasties’ stability. Around 2160 B.C., a civil war among governors began which marked the First Intermediate period. Egypt was again separated into two kingdoms, but was ultimately reunited by Prince Mentuhotep. During the Second Intermediate period, the 15th dynasty rulers, called Hyksos, governed side by side with Theban rulers. Egypt reunited again under King Ahmose I, marking the New Kingdom period. King Amenemhet, ruler of the 12th dynasty, founded the Middle Kingdom age of Egypt. Egypt once again flourished by being more aggressive in its international relations. In 332 B.C., the conquest of Egypt by Alexander the Great commenced the Greek period in Egypt. Egypt links Africa to the Middle East. The country is divided into Upper Egypt (sedgeland) and Lower Egypt (northland). In terms of population and area, Cairo is the largest city in Africa and the Middle East. The Suez Canal links the Mediterranean Sea to the Red Sea. Between the Red Sea and the Mediterranean Sea is the Sinai Peninsula, a desert region in Egypt which is the only part of Egypt considered to be a part of Asia. Other than Sinai, The Sahara and Libyan Deserts are the major deserts of Egypt. Nile River Delta is the only delta in Egypt. It is triangular. The Aswan high dam is the world’s largest dam. The Pyramids of Giza are the only surviving Seven Ancient Wonders of the World to date. They still have unexplored passageways inside. 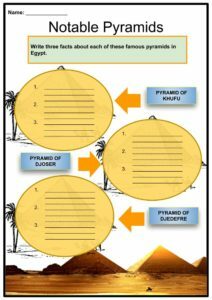 The Pyramid of Khufu, also known as the Great Pyramid of Giza, is the largest among the pyramids. Egypt is not only known for its beautiful pyramids – located in Cairo, the Al-Azhar park is one of the world’s top public spaces according to Project for Public Spaces. Egypt has the biggest Arabic population in the world. An estimated 65 million Muslims live in Egypt. 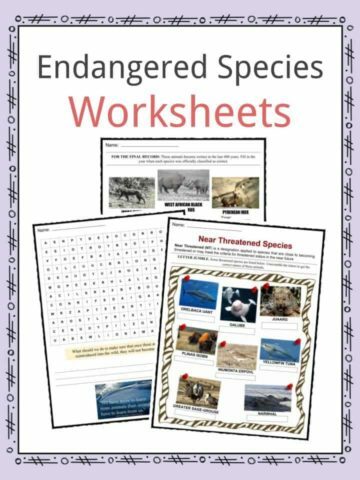 Egypt is home to a diverse flora and fauna, however, habitat loss and hunting threaten animals. 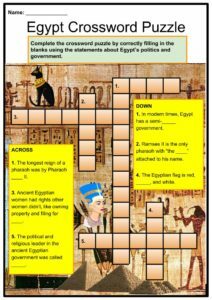 The political and religious leader in the ancient Egyptian government is called pharaoh. In modern times, Egypt has a republican, semi-presidential government. An elected president holds a four-year term. The longest reign of a pharaoh was by Pharaoh Pepi II. The greatest ruler known was Ramses II, as he is the only pharaoh with “the Great” attached to his name. He ruled for 60 years. In the ancient times, Egyptian women had rights other women didn’t, like owning property and filing for divorce. The Egyptian flag is red, black, and white. Mummification is the preservation of a dead person’s body. To the Egyptians, this signified a safe transition to the afterlife. To mummify a body, it is first embalmed, then it is wrapped and buried. 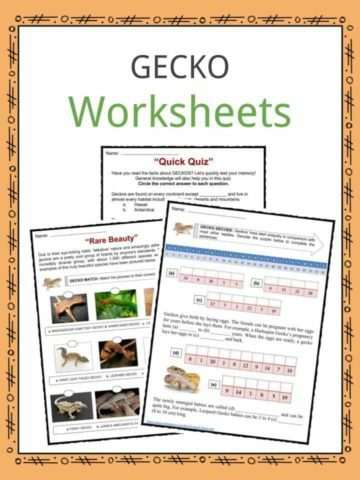 Mummification applies to both humans and animals. Ancient Egyptian people wore makeup believing it was able to heal them. Copper was used to make green makeup and lead was used to make black makeup. Both men and women wore makeup. 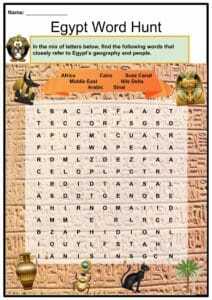 The Egyptian alphabet was called hieroglyphics and was the country’s formal writing system. Hieroglyphs, meaning sacred writing, are photographic. They were used to record information. 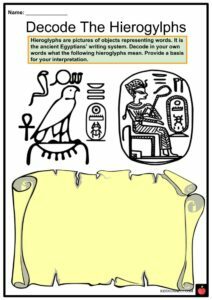 There are over 700 hieroglyphs in ancient Egyptian writing. Tourism is a major part of Egypt’s economy. Oil and gas are Egypt’s most valuable resources. Football is the most popular sport in Egypt. The first sailboats were made in Egypt. The Khamsin is a kind of windstorm occurring only in North Africa and known in Egypt as khamaseen. 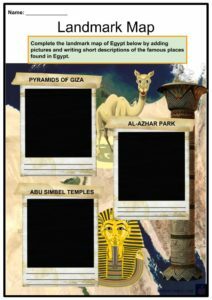 This is a fantastic bundle which includes everything you need to know about Egypt across 23 in-depth pages. 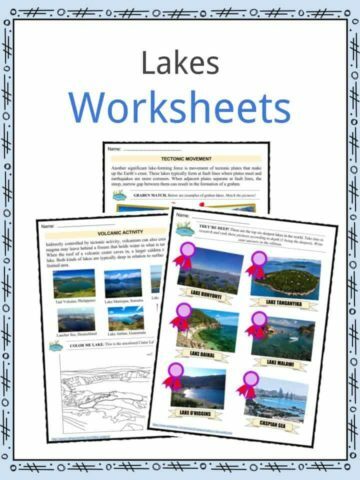 These are ready-to-use Egypt worksheets that are perfect for teaching students about the Egypt which is an Afro-Asiatic transcontinental country spanning the northeast corner of Africa and southwest corner of Asia via a land bridge formed by the Sinai Peninsula. It is officially known as the Arab Republic of Egypt, but it is also known as the land of the Pharaohs. One of the country’s most famous landmarks is the Pyramids of Giza.